We visited Laguna Madre de Marismas first and last thing today, both visits were productive and produced new species for the trip list. Our early morning visit was just great the laguna was flat calm and as it light the colours were magical. We stood and watched the ‘egret’ roost, Night herons were arriving whilst Cattle Egret and Glossy Ibis were moving out, watching this busy activity was a fascinating experience. We found a single Common Snipe a small pool just below the egret roost. The light improved as walked back towards the hotel we could now see the reed-beds clearly, we picked out a few Western Swamphens, Reed Warblers and to our great delight a male Little Bittern sat out for a while. 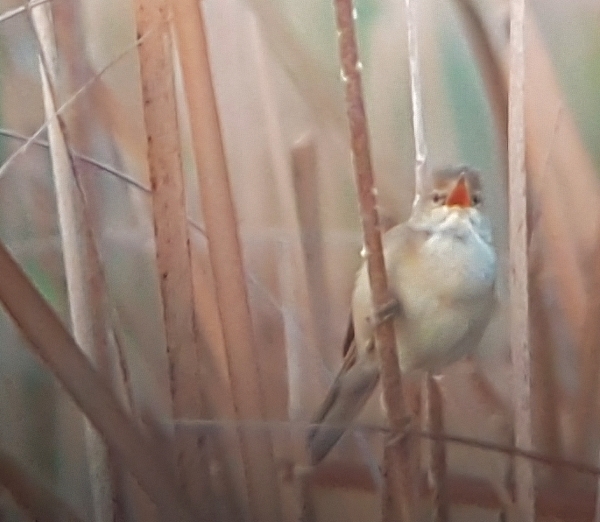 Before we went into breakfast we noted a Great Reed Warbler which was sort of singing but hadn’t quite mastered a full song just yet. 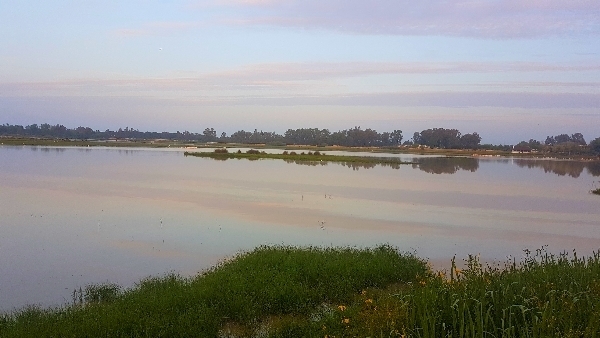 Our morning was taken up by long walks along the board walks in the Reserve at La Rocina, in recent years very water sat in the pools below the hides but this year there was plenty, we saw a good number of species and added Purple Heron to the list. We also saw the exotic ‘escapee’ species Common Waxbill and Common Stonechat. The bushes and woodland was alive with the sound of Common Nightingales, dozens of them, but very few other species were out there. Blackcap, Short-toed Treecreeper and a distant Iberian Woodpecker was all we saw and heard. From one boardwalk we had nice views over an inlet covered in reeds and that was where we saw our first Savi’s Warbler, we had heard them ‘reeling’ since we arrived but this was our first actual sighting. From the car park we found a Woodlark, it was singing from a power line, a Woodchat Shrike sat below it. 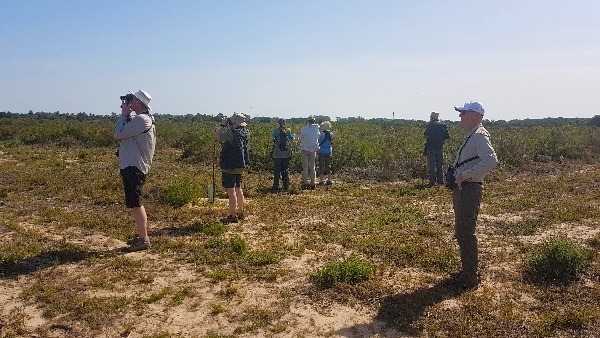 From La Rocina we drove further into the reserve to an area of heathland, we saw Bee-eaters, more Woodchat Shrikes, Sardinian Warbler and our target bird the Dartford Warbler. The sky was always alive with Bee-eaters, Black Kites and swarms of hirundines. Before lunch we walked a circular pathway through the only ancient deciduous woodland in Donana at the Palicio de Acebron. Again it was full of Common Nightingales, I’ve never heard so many, but very few other species sang or showed. 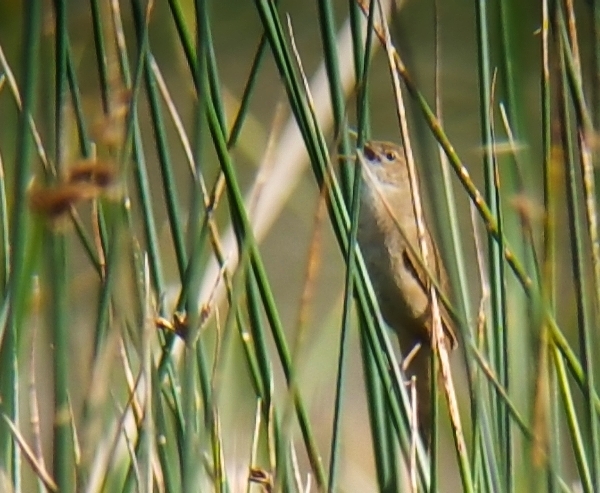 We did get brief views of an Iberian Chiffchaff and some of the group watched a Cetti’s Warbler for quite a while. The highlight of our woodland walk was the sighting of a Eurasian Wryneck, what a crowd pleaser. We also heard Lesser Spotted Woodpecker but never saw one. 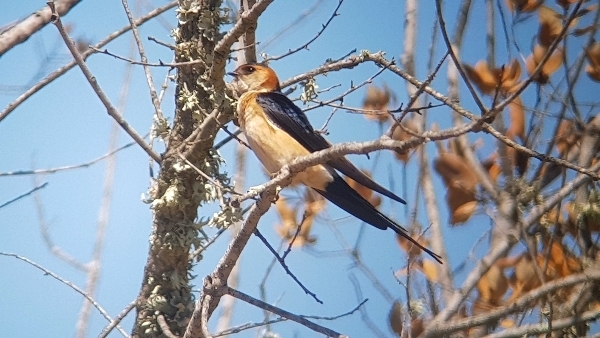 We ate lunch in the visitor’s centre at the Acebuche Reserve, Iberian Magpies and Red-rumped Swallows seemed to be everywhere. For the last four years the lagunas at this reserve have been dry and as a consequence of this drought many White Poplar trees have died, it is a sad sight. Golden Orioles used to be found in the those tree but not now. In fact, our walk along the boardwalks and our visits to the hides didn’t produce any new species and very few others. We did find another Dartford Warbler and plenty of common species were about but nothing new appeared. Our late afternoon visit to the Laguna de Madre de Marsimas was a windy affair, the gusty breeze made scoping a little difficult but we added a single new species to the list, Common Greenshank. Dinner was once again taken in doors because it was still too chilly to eat out on the terrace, it was alovely dinner and the wine wasn’t too bad either.